Laser carbon facial wrinkle reduction is one of the very latest innovative non invasive facial rejuvenation treatments for all skin types even the most sensitive! With no downtime, delivering immediate results that will help to create a much more youthful complexion. The Carbon Laser Facial is often known as The Charcoal Facial or The Black Faced Doll Facial and creates a porcelain dolls complexion. It is one of the most advanced treatments for minor skin imperfections and promotes a smooth and glowing complexion. The Carbon Laser Peel Treatment helps reduce fine lines and wrinkles including ‘crow’s feet’. The process is non invasive and pain free. How does Laser Carbon Skin Rejuvenation work? The laser treatment is suitable for all ages and can lighten age spots and dark spots, fade freckles, reduce wrinkles and fine lines, shrink pores, and remove blackheads and acne. It can also lift and tighten the skin, improve elasticity, moisturise and give a bright and radiant complexion. The principle behind the black doll treatment is that carbon powder possesses a strong capacity to absorb dirt deep in the pores. The face (and neck) is first coated with carbon nano-particles. Next the laser is used on the skin. The medical-graded laser allows the particles to penetrate deep into pores, shattering the epidermal keratinocytes and dirt. The heat from the laser also enables the carbon powder to be absorbed into the skin, stimulating the skin cells. Regeneration occurs by encouraging growth of collagen and elastic fibres. After cleansing Carbon Paste is massaged into face, then high intensity pulses of light are delivered from the laser which destroys debris clogged in the pores. This state of the art laser treatment helps refine enlarged pores which reduce oil secretion and helps remove blackheads and whiteheads. The treatment stimulates the face to produce more collagen which helps reduce fine lines and wrinkles. It is advised that you use a sun protection cream after treatment with a minimum SP30. A course of 6 sessions is recommended for maximum results and discounts are available for courses. 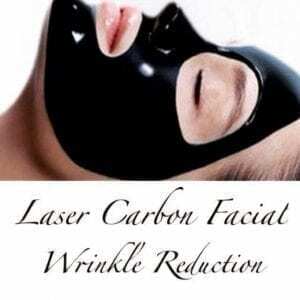 What are the benefits of Laser Carbon Facials? After Carbon Laser Facial, we recommend White Doll Facial which can be proceed immediately and helps with collagen and elastin production in the skin.